We carry out thousands of repairs every week, big and small, and we don't pay profits to shareholders - any profit we make goes back into our parent company, East Lothian Housing Association. So, whatever happens, we'll always be here for you - and if you join our free membership scheme, that means 24 hours a day, 365 days a year. Watch our new TV advert being shown across the region now! WHY NOT JOIN FOR MEMBERSHIP BENEFITS? Diagnose & Fix is a service we offer, and it couldn't be simpler. We'll send out one of our trusted tradesman to help diagnose the repair, and if it will take up to half hour's labour to solve the problem, it can be fixed there and then. 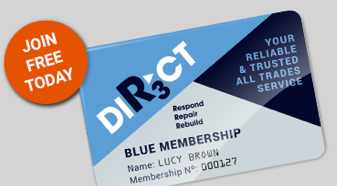 A FREE membership with R3 Direct means we'll be here for you 24 hours a day, 365 days a year! Signing up is quick and east, simply follow this link and sign up today.